SOURCE: AP/Ng Han Guan A patient receiving treatment at the Tiantan Puhua Hospital in Beijing, China in 2007. 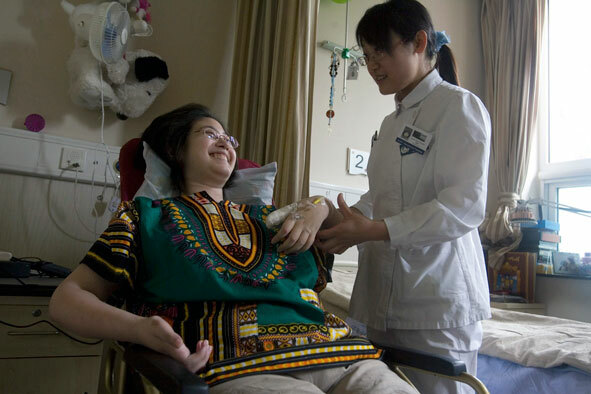 Tiantan Puhua, a joint venture between Asia's largest neurological hospital and American Pacific Medical Group, specialize in using stem cells injections to treat diseases ranging from stroke and spinal cord injuries to cerebral palsy and ataxia. “There is no one China,” a colleague concluded during a discussion of the current state of regenerative medicine in the country. And it is hard to disagree. The streets of Beijing illustrate the stark dichotomy of a state struggling to blend its new high tech and economic growth with the old-school feel of communist rule: cranes build luxurious skyscraper condominiums while Google struggles to make the Internet fully accessible. Mirrored in the yin-yang dichotomy of the stem cell field, China has quickly risen as a stem cell powerhouse but has struggled to set regulations that would impinge on the clinical availability of unproven therapies to patients from China and around the world. The Chinese government has rapidly built up its scientific capacity in regenerative medicine, including stem cells, tissue engineering, and gene therapy. China’s success in this field is increasingly hard to deny—they are now the 5th largest publisher of peer-reviewed papers on stem cells research in the international scientific literature, shooting from 37 publications in 2000 up to 1,116 in 2008. Although still short of the United States’s 6,008 stem cell publications in 2008, China’s publication levels nearly match those of the United Kingdom, Japan, and Germany. But how has China built its regenerative medicine field so quickly? Our recent study published in the UK journal Regenerative Medicine highlights China’s successful approach to stem cell research, and the challenges they need to address to progress further in the field. Conducted by members of the McLaughlin-Rotman Center for Global Health, this study is based on interviews in China with 47 experts on regenerative medicine from universities, research institutes, hospitals, firms, government agencies, and funding agencies. We found the Chinese government has employed a highly successful four-pronged approach to building up regenerative medicine, combining a powerful recruitment strategy for researchers, ample funding, permissive regulations, and a focus on rapidly deriving applications. Their success, however, has been checked by international push-back against clinics currently offering unproven stem cell therapies. China has made strides to reform their clinical regulation and the country’s star will undoubtedly continue to rise in the stem cell field. But the United States should not be complacent about China’s contribution to the field and should both keep a close eye on its development and possibly engage with the Chinese on stem cell science and regulation. Regenerative medicine therapies are an attractive solution to an increasing burden of chronic disease faced by China’s large and aging population. Research in the field aspires to produce solutions to a number of chronic conditions, including cardiovascular disease, diabetes, and degenerative conditions associated with age. As a result, the Chinese government has identified it as a health research priority. China’s second major strategy—generous financing—is a more common but still essential strategy for building the regenerative medicine sector. The Ministry of Science and Technology has made up to $293 million available for stem cell research alone between 2006-2010, with an additional $20 million per year coming from the Chinese Academy of Science. [4, 5] These funds have created top-notch research and animal testing facilities and extensive project grants that allow researchers to carry their ideas forward. Although paltry compared to American stem cell funding, this money is divided between comparatively few researchers in China. The cost of conducting research— including wages, physical overhead, and material costs—is much lower in China and researchers seldom complain that a lack of available funding holds their research back. In addition to these inputs, two other factors have been key to China’s success in regenerative medicine: permissive regulations for stem cell research, and a clear focus of resources on applications of the science. Rules on embryonic stem cell research in China are more permissive than those in many jurisdictions in the United States, and are similar in nature to what is allowed in the UK. These regulations permit therapeutic cloning, the use of surplus embryos or discarded fetal cells from abortions, and embryos created from somatic cell nuclear transfer or parthenogentic split blastocytes, and in some cases, the fusion of human genetic material with nonhuman oocytes. The embryo in Chinese religions is not typically perceived as having personhood, so embryonic stem cell research was neither as ethically contentious nor as hotly debated as it was in the United States and other parts of the world. One of our participants explained: “When we draft our guidelines, we always need to think about our culture as well. For the Chinese people, we have not so strong religious ideas about [the embryo]…This is not a person, we don’t think so… so we accept.” Chinese researchers and policymakers saw the limitations placed on their United States colleagues during the Bush administration and prior to the Obama administration’s support as a boon and opportunity to excel. China has also strongly focused their research objectives towards generating therapeutic applications. Moreover, universities and hospitals have the tight relationships needed to understand patient needs and translate research from lab to clinic, making China a front-runner in the race to develop therapies. In the words of a Chinese researcher: “I trust on the R&D and the clinical applications, [that] we will become one of the leaders.” But this orientation towards applications comes at a cost to basic research, and interviewees indicated this may slow their ability to overcome future technical barriers to new therapies. Up until now, limited regulation of clinical stem cell therapies in China has allowed some firms and hospitals to offer controversial stem cell therapies without requiring the scientific evidence to back them up. Over 200 hospitals are estimated to provide these therapies, and three of the main centers target foreign patients for their therapies—often patients desperate and with few or no treatment options available in their home countries. These clinics offer stem cell treatments as a panacea for currently untreatable medical problems, including ataxia, brain and spinal cord injury, diabetes, Parkinson’s, multiple sclerosis, autism, and cerebral palsy. International critics of stem cell research in China have often erroneously lumped together stem cell research with these stem cell clinics, when they are in fact quite distinct. Top-quality research on regenerative medicine in China is mostly produced at academic institutions, national research centers, and by few small firms. Stem cell centers offering unproven therapies, on the other hand, do not publish in international scientific journals and are criticized by many Chinese researchers for offering treatments ahead of their time and for hurting the credibility of legitimate Chinese stem cell research. In May of 2009, the Ministry of Health in China announced new regulations for the clinical application of stem cell therapies. These rules will require stem cell centers to provide evidence of the safety and efficacy of the therapies they offer. But these treatments are still available, as the government is working through the details of these regulations. Afterwards, the Ministry of Health will need to evaluate each available therapy according to the Ministry’s new criteria, so it will be some time before we know what impact these new regulations have on the stem cell landscape in China. Whether China succeeds in overcoming the controversy around its stem cell clinics will largely depend on its ability to regulate them. The government’s development of new clinical regulations show its commitment to changing the status quo of how these therapies are offered, but strict implementation of the new regulations will be required to quell international criticisms. Our analysis shows the importance of supportive research policies, permissive research regulations, and consistent long-term financing for priority areas, as well the importance of developing a sustainable and highly skilled labor force dedicated to developing therapeutic applications to basic research. China’s struggle to overcome the negative image of its stem cell clinics shows how essential it is for regulations to be developed alongside, instead of in hindsight, of new emerging technologies. The Chinese regulatory struggle mirrors, to a degree, an ongoing discourse between North American researchers and regulatory agencies about what evidence and safeguards are required to pursue safe and effective translation of stem cell research. The difficulty of this process is reflected in the mixed response to the first embryonic stem cell trial in the United States, run by the California company Geron Corp. The trial is seen by some as an important step forward, but has been widely criticized by others as risky and based on insufficient evidence. Approved and twice halted by the FDA, the trial has yet to begin on patients but is expected to resume in late 2010. In light of our findings, U.S. policymakers should consider actively promoting collaborations with top-notch Chinese scientists on research, development, and regulation. China has had setbacks, but if they keep building on their strengths and overcoming their regulatory challenges, the country may stand at the forefront of the race to develop internationally recognized regenerative medicine treatments and therapies that patients desperately need everywhere around the global. Dominique McMahon is a Doctoral candidate at the Institute of Medical Sciences, University of Toronto. Halla Thorsteinsdóttir is an Associate Professor in the Dalla Lana School of Public Health at the University of Toronto and a member of the McLaughlin-Rotman Centre for Global Health. Peter A. Singer is Professor of Medicine, Sun Life Financial Chair in Bioethics and Director at the McLaughlin- Rotman Centre for Global Health, University Health Network and University of Toronto. Abdallah S. Daar is Professor at the Dalla Lana School of Public Health, Professor of Surgery at the University of Toronto and is Director of Ethics and Commercialization at the McLaughlin-Rotman Centre for Global Health. McMahon DS, Thorsteinsdóttir H, Singer PA, Daar AS, “Cultivating regenerative medicine innovation in China,” Regen. Med. 5(1), 35–44 (2010). Wang Q, “What kinds of overseas talents does China need?” (2007). Ministry of Science and Technology, “China Science and Technology Statistics Data Book,” People’s Republic of China (2007). International Stem cell Forum: About ISCF members, Chinese Academy of Sciences. “There is no one China,” a colleague concluded during a discussion of the current state of regenerative medicine in the country. And it is hard to disagree. The streets of Beijing illustrate the stark dichotomy of a state struggling to blend its new high tech and economic growth with the old-school feel of communist rule: cranes build luxurious skyscraper condominiums while Google struggles to make the Internet fully accessible. Mirrored in the yin-yang dichotomy of the stem cell field, China has quickly risen as a stem cell powerhouse but has struggled to set regulations that would impinge on the clinical availability of unproven therapies to patients from China and around the world. The Chinese government has rapidly built up its scientific capacity in regenerative medicine, including stem cells, tissue engineering, and gene therapy. China’s success in this field is increasingly hard to deny—they are now the 5th largest publisher of peer-reviewed papers on stem cells research in the international scientific literature, shooting from 37 publications in 2000 up to 1,116 in 2008. Although still short of the United States’s 6,008 stem cell publications in 2008, China’s publication levels nearly match those of the United Kingdom, Japan, and Germany. But how has China built its regenerative medicine field so quickly? Our recent study published in the UK journal Regenerative Medicine highlights China’s successful approach to stem cell research, and the challenges they need to address to progress further in the field. Conducted by members of the McLaughlin-Rotman Center for Global Health, this study is based on interviews in China with 47 experts on regenerative medicine from universities, research institutes, hospitals, firms, government agencies, and funding agencies. We found the Chinese government has employed a highly successful four-pronged approach to building up regenerative medicine, combining a powerful recruitment strategy for researchers, ample funding, permissive regulations, and a focus on rapidly deriving applications. Their success, however, has been checked by international push-back against clinics currently offering unproven stem cell therapies. China has made strides to reform their clinical regulation and the country’s star will undoubtedly continue to rise in the stem cell field. But the United States should not be complacent about China’s contribution to the field and should both keep a close eye on its development and possibly engage with the Chinese on stem cell science and regulation. Regenerative medicine therapies are an attractive solution to an increasing burden of chronic disease faced by China’s large and aging population. Research in the field aspires to produce solutions to a number of chronic conditions, including cardiovascular disease, diabetes, and degenerative conditions associated with age. As a result, the Chinese government has identified it as a health research priority. The government has employed four main strategies in this effort. The first focuses on people. China made recruiting Chinese researchers back to the country a specific strategy within their 11th Five Year Plan for 2006-2010, indicating that engaging “internationally published” returnees is of primary importance to the development of the science sector. China has built a skilled labor force by using financial and research incentives to recruit scientists trained at eminent stem cell research centers in the United States and UK back to China. Called “sea turtles” because of the term’s resemblance to “overseas returnees” in Chinese, those returning from the diaspora make up the backbone of research being done in the country’s institutions of excellence. These labs in turn train a new generation of home-grown scientists from among China’s 400,000 annual graduates in science and medicine. [1, 3] According to one interviewee: “There is a younger generation of scientists being almost completely trained here, to become good professors, to become principal investigators.” China’s second major strategy—generous financing—is a more common but still essential strategy for building the regenerative medicine sector. The Ministry of Science and Technology has made up to $293 million available for stem cell research alone between 2006-2010, with an additional $20 million per year coming from the Chinese Academy of Science. [4, 5] These funds have created top-notch research and animal testing facilities and extensive project grants that allow researchers to carry their ideas forward. Although paltry compared to American stem cell funding, this money is divided between comparatively few researchers in China. The cost of conducting research— including wages, physical overhead, and material costs—is much lower in China and researchers seldom complain that a lack of available funding holds their research back. In addition to these inputs, two other factors have been key to China’s success in regenerative medicine: permissive regulations for stem cell research, and a clear focus of resources on applications of the science. Rules on embryonic stem cell research in China are more permissive than those in many jurisdictions in the United States, and are similar in nature to what is allowed in the UK. These regulations permit therapeutic cloning, the use of surplus embryos or discarded fetal cells from abortions, and embryos created from somatic cell nuclear transfer or parthenogentic split blastocytes, and in some cases, the fusion of human genetic material with nonhuman oocytes. The embryo in Chinese religions is not typically perceived as having personhood, so embryonic stem cell research was neither as ethically contentious nor as hotly debated as it was in the United States and other parts of the world. One of our participants explained: “When we draft our guidelines, we always need to think about our culture as well. For the Chinese people, we have not so strong religious ideas about [the embryo]…This is not a person, we don’t think so… so we accept.” Chinese researchers and policymakers saw the limitations placed on their United States colleagues during the Bush administration and prior to the Obama administration’s support as a boon and opportunity to excel. China has also strongly focused their research objectives towards generating therapeutic applications. Moreover, universities and hospitals have the tight relationships needed to understand patient needs and translate research from lab to clinic, making China a front-runner in the race to develop therapies. In the words of a Chinese researcher: “I trust on the R&D and the clinical applications, [that] we will become one of the leaders.” But this orientation towards applications comes at a cost to basic research, and interviewees indicated this may slow their ability to overcome future technical barriers to new therapies. Up until now, limited regulation of clinical stem cell therapies in China has allowed some firms and hospitals to offer controversial stem cell therapies without requiring the scientific evidence to back them up. Over 200 hospitals are estimated to provide these therapies, and three of the main centers target foreign patients for their therapies—often patients desperate and with few or no treatment options available in their home countries. These clinics offer stem cell treatments as a panacea for currently untreatable medical problems, including ataxia, brain and spinal cord injury, diabetes, Parkinson’s, multiple sclerosis, autism, and cerebral palsy. International critics of stem cell research in China have often erroneously lumped together stem cell research with these stem cell clinics, when they are in fact quite distinct. Top-quality research on regenerative medicine in China is mostly produced at academic institutions, national research centers, and by few small firms. Stem cell centers offering unproven therapies, on the other hand, do not publish in international scientific journals and are criticized by many Chinese researchers for offering treatments ahead of their time and for hurting the credibility of legitimate Chinese stem cell research. In May of 2009, the Ministry of Health in China announced new regulations for the clinical application of stem cell therapies. These rules will require stem cell centers to provide evidence of the safety and efficacy of the therapies they offer. But these treatments are still available, as the government is working through the details of these regulations. Afterwards, the Ministry of Health will need to evaluate each available therapy according to the Ministry’s new criteria, so it will be some time before we know what impact these new regulations have on the stem cell landscape in China. Whether China succeeds in overcoming the controversy around its stem cell clinics will largely depend on its ability to regulate them. The government’s development of new clinical regulations show its commitment to changing the status quo of how these therapies are offered, but strict implementation of the new regulations will be required to quell international criticisms. It is time to start taking China seriously. China’s progress in regenerative medicine has gone largely unnoticed because of the Western media’s focus on stem cell tourism, but this progress is a source of national pride and shows no signs of slowing. As one Chinese interviewee stated: “We don’t want to just copy other research, we want to do something innovative. The leaders are first class researchers, they impact the field…we want to be first class, to have an impact.” Our analysis shows the importance of supportive research policies, permissive research regulations, and consistent long-term financing for priority areas, as well the importance of developing a sustainable and highly skilled labor force dedicated to developing therapeutic applications to basic research. China’s struggle to overcome the negative image of its stem cell clinics shows how essential it is for regulations to be developed alongside, instead of in hindsight, of new emerging technologies. The Chinese regulatory struggle mirrors, to a degree, an ongoing discourse between North American researchers and regulatory agencies about what evidence and safeguards are required to pursue safe and effective translation of stem cell research. The difficulty of this process is reflected in the mixed response to the first embryonic stem cell trial in the United States, run by the California company Geron Corp. The trial is seen by some as an important step forward, but has been widely criticized by others as risky and based on insufficient evidence. Approved and twice halted by the FDA, the trial has yet to begin on patients but is expected to resume in late 2010. In light of our findings, U.S. policymakers should consider actively promoting collaborations with top-notch Chinese scientists on research, development, and regulation. China has had setbacks, but if they keep building on their strengths and overcoming their regulatory challenges, the country may stand at the forefront of the race to develop internationally recognized regenerative medicine treatments and therapies that patients desperately need everywhere around the global. Dominique McMahon is a Doctoral candidate at the Institute of Medical Sciences, University of Toronto. Halla Thorsteinsdóttir is an Associate Professor in the Dalla Lana School of Public Health at the University of Toronto and a member of the McLaughlin-Rotman Centre for Global Health. Peter A. Singer is Professor of Medicine, Sun Life Financial Chair in Bioethics and Director at the McLaughlin- Rotman Centre for Global Health, University Health Network and University of Toronto. Abdallah S. Daar is Professor at the Dalla Lana School of Public Health, Professor of Surgery at the University of Toronto and is Director of Ethics and Commercialization at the McLaughlin-Rotman Centre for Global Health. McMahon DS, Thorsteinsdóttir H, Singer PA, Daar AS, “Cultivating regenerative medicine innovation in China,” Regen. Med. 5(1), 35–44 (2010). Wang Q, “What kinds of overseas talents does China need?” (2007). Ministry of Science and Technology, “China Science and Technology Statistics Data Book,” People’s Republic of China (2007). UK Stem Cell Initiative [UKSCI]: “Global positions on stem cell research.”  International Stem cell Forum: About ISCF members, Chinese Academy of Sciences.